Margaret of York was the daughter of one of the principal families who fought the War of the Roses in England during the 15th century. She lost some important family members in the War but two of her brothers became King of England; Edward IV and Richard III. Her brother Edward arranged a marriage for her that was one of the most brilliants matches of the century. 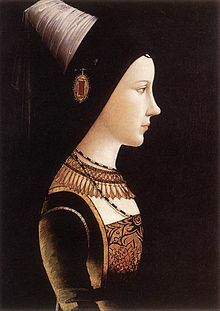 She was the Duchess of Burgundy, wife of Charles the Bold, from 1468 to 1477. When she became a childless widow, she managed to create a comfortable, wealthy life and was allowed to have a principal role in Burgundian government for her husband’s heirs until her death at the age of fifty-seven. Margaret was born on May 3, 1446 either at Fotheringay Castle or Waltham Abbey during the War of the Roses. Her father was Richard, Duke of York and her mother was Cecily Neville. Richard had a strong claim to the throne of England but his position at court was tenuous. He would openly rebel against the Lancastrian King Henry VI, making York family life unstable. Richard didn’t get much support for his claim and he was to die in the Battle of Wakefield in 1460. Most of the time between the death of her father and the crowning of her brother as King Edward IV was spent in London at Baynard’s Castle. Whether she was born at Fotheringay or not she may have spent some of her childhood there and came to love the books and manuscripts in the collegiate library. She would have had the normal education of a high born lady of the time. When Edward became king in 1461, Margaret was fifteen and became one of the leading ladies in England. Her education and training were accomplished. Margaret was never described as beautiful. She was slim and fair with light colored hair. She was nearly six feet tall with fine features, grey eyes, a small mouth, a warm smile, and a wry sense of humor. She was gracious and pious, very intelligent, full of energy and had a strong will. She was keenly interested in dynastic and political affairs and had learned how to administer a household from her mother. All this would prove to be significant when she married. It was now up to her brother to arrange a marriage for her and it took seven years to find the right alliance. In May of 1465, the first recording of an appearance of Margaret was at the coronation of Elizabeth Woodville as Queen to her brother. She was then in the employ of the Queen. Proposals for her hand began to come in. She was nearly betrothed to Don Pedro of Aragon, a nephew of Isabel, Duchess of Burgundy, mother of Charles the Bold, but he died in June of 1466. Isabel began working to ally Burgundy with England, vacillating between an alliance with the house of York or Lancaster depending on the political situation in England. She needed this alliance to fight off detrimental intervention from France and eventually chose the house of York. Isabel’s son Charles, the Count of Charolais, had been married twice. His second wife, Isabella of Bourbon, had born him a daughter Mary in 1457. Isabella suffered from tuberculosis and died in 1465. Within two weeks of her death, Duchess Isabel sent envoys to England seeking Margaret’s hand for Charles. 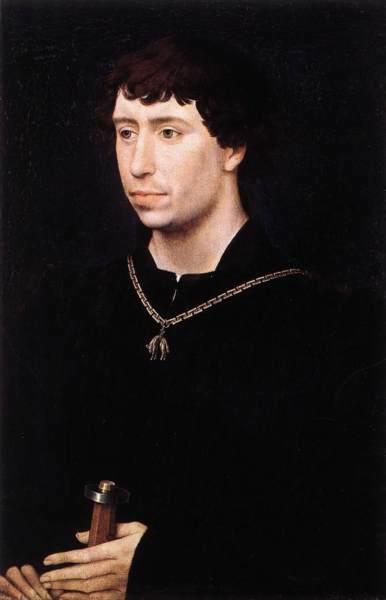 Charles succeeded his father as Duke of Burgundy when Philip the Good died in June of 1467. It wasn’t until October of 1467 that King Edward agreed to the match. Edward made his decision public and Margaret appeared before the royal council to give her formal consent. 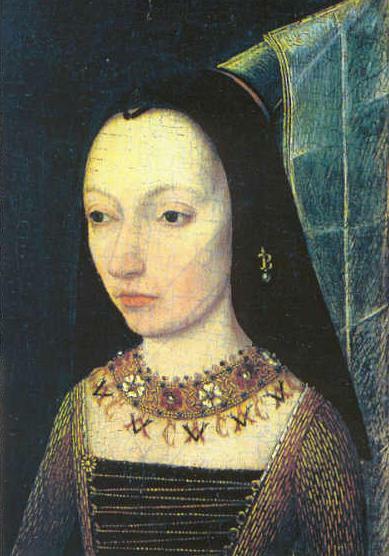 Commercial interests were closely allied with the match and Isabel of Burgundy negotiated the marriage treaty, basing it on her own marriage contract. The treaty addressed the marriage, peace and trade agreements and was really more favorable to Margaret than Isabel’s own marriage settlement had been in 1429. Edward IV was to pay for Margaret’s dowry of 200,000 crowns in three installments. The agreement was signed by all parties in March of 1468. From November 1467 until the wedding in June of 1468, King Louis XI of France did everything in his power to interfere with the negotiations, including slandering Margaret’s character, suggesting she was not a virgin and had born a son. Louis even tried to block the papal dispensation necessary for the fourth degree cousins to marry. The marriage was to be the first great event of Duke Charles’ reign. Margaret sailed in June and arrived at Sluys. Duchess Isabel had carefully planned all the festivities for the marriage. She met Margaret with her grand-daughter Mary and they retired to a private dinner for three hours. Although Mary greatly missed her mother, she had much in common with Margaret. They both enjoyed hunting, riding, reading and falconry. They were to enjoy each other’s company for the rest of their lives and Margaret cherished Mary as if she were her own daughter. Margaret was twenty two and thirteen years younger than Charles, not to mention quite a bit taller. When she finally met Charles the next day, she had to stoop down to receive a kiss from him. They were married a week later in a private ceremony in the home of a merchant in Damme. Charles left immediately afterwards for Bruges and greeted Margaret when she made a grand entry into the city in the pouring rain. Nine days of celebration ensued. The festivities were so splendid they have become near legend and remain in folklore to this day. Charles then left Bruges and Margaret and Marie travelled in Flanders, Brabant and Hainault. They ended up spending the rest of the summer in Brussels. Margaret’s titles after her marriage were: Duchess of Burgundy and of Lotharingia, of Brabant, Limbourg, Luxembourg and Guelders, Countess of Flanders and of Artois, of Burgundy, of Hainault, Holland, Zeeland, Namur and Zutphen, Marchioness of the Holy Roman Empire, Lady of Friesland and of Salins and Malines, etc. These titles represented one of the most wide-ranging, extensive and valuable collections of territory in medieval Europe. Burgundy was a creation of a succession of historic chances and was really only secure when its neighbors were weak. The duchy had one of the largest urban populations in Europe. Margaret’s role was negligible in the first three years of her marriage but after 1472, she became active in affairs of state. Margaret would learn the government of Burgundy was widespread and she would be required to travel regularly. She was to play an active role in the government as an administrator and as the Duke’s representative. While she was Duchess she made twenty eight major journeys. Her travels were meant to uphold ducal authority. She attended functions of state and raised money and men for the wars her husband fought. Margaret had to deal with the consequences of her husband’s failed foreign policy. The peak of Charles’ reign came in 1472-3. His brother-in-law King Edward was back on the English throne. The duchy had withstood a French invasion. Charles had conquered areas of Alsace, Guelders and Zutphen and he was consolidating his power in Lorraine. There was peace and prosperity in the duchy. The household and the army had been reorganized and the government was functioning well. Margaret had a household that mirrored her husband’s. In the summer of 1472, a fire broke out in her castle in Ghent, destroying rings, jewels, tapestries, furs and clothing valued between 50,000 and 60,000 crowns. Margaret was to remain childless during her marriage and she made pilgrimages to shrines for help becoming pregnant. In the first seven years of their marriage Margaret and Charles were only together for a total period of one year. They were together regularly for the first four years. After December 1471, they only saw each other for a total of thirty two days until 1475. After July 23, 1475, they never saw each other again as Charles was continually away at war. Margaret gave her stepdaughter Mary guidance and support during this time and their closeness would serve each other well especially in the seminal year of 1477. From 1474 on, alliances began to form against Charles. He was forced to make costly campaigns and stay in the field with his armies. After making a truce with France in 1474, Charles began to concentrate on fighting in the Rhineland. During 1476, there were disastrous defeats for the Burgundian army. By November Charles had arranged for Mary to marry the Archduke Maximilian of Austria and started to besiege Nancy in Lorraine. There was hope to an end to the war in Lorraine. By early January reports began to come into Ghent that the Burgundians had met with disaster at Nancy and that Charles was dead. By January 22, Margaret was wearing mourning garb. Margaret and Mary were acting jointly from this point on. They had to act quickly. They wrote to King Louis XI asking for help but whether they were serious or not is questionable. Margaret knew Louis was ready to seize the Duchy and there were internal disruptions. Their situation was quite serious. Some of their advisors were seized and beheaded. Margaret and Mary hastened to call a meeting of the estates general at Ghent. Margaret was forced to flee Ghent for her own safety. Mary was a virtual prisoner. Mary made a speech where she renounced a huge levy that had been given to her father, relieving the estates of the debt. There was a charter drawn up designed to restore local rights and privileges. She promised to rule with the advice of the council in all matters, including her marriage, war and peace. Margaret began work to negotiate the final terms of the marriage treaty between Mary and Maximilian. The terms stipulated Maximilian could not inherit the Duchy. All of Burgundy was to go to the children of the marriage. Maximilian arrived penniless in Burgundy in August 1477. Mary and Maximilian were married immediately. They managed to get along well. In gratitude to her stepmother, Mary provided Margaret her full dower rights. By March of 1477, Margaret had everything that belonged to her. Mary even made sure her full dowry was paid to her as her brother Edward had defaulted on the payments. Margaret proceeded to buy the biggest house in Malines and surrounding lands and established her dowager court there. She had a large household including several doctors. She hosted great noblemen and foreign embassies. There was no question of her leaving Burgundy now. She was one of the richest widows in Europe and held her own court. Margaret lost her brother George, Duke of Clarence when he was arrested and executed for treason. She carried Mary’s son Philip to his christening. She raised men and money to help Mary and Maximilian battle France. She was assigned to negotiate with England in 1480 and travelled there for three months. Her efforts paid off but Maximilian ended up working against her by making an alliance with France. In 1482, Mary died after a fatal fall from a horse while hunting. On her deathbed, she begged Margaret to watch over her children, Philip and young Margaret of Austria. Mary had named Maximilian as regent for her son but this was bitterly opposed. The estates wanted a council to rule. Margaret and Maximilian held things together and they made some progress, especially when their old enemy Louis XI died. In July 1485, Margaret took physical custody of Philip at her home in Malines and she served as a mother and mentor to her step-granddaughter Margaret. King Edward IV died in 1483. Margaret’s brother Richard usurped the throne from his nephew Edward V. Margaret and Maximilian supported Richard hoping he would subsidize their efforts against France. In 1485, the House of York was eclipsed by Lancaster when Henry VII defeated Richard III at the Battle of Bosworth. Margaret did everything in her power to work against the Tudor King, including supporting pretenders to the English throne like Perkin Warbeck and others. There was more civil war, truce and peace in Burgundy. Young Philip came of age in 1494 and Margaret had fulfilled her promise to Mary on her deathbed. Margaret continued to maintain a lavish household while travelling in the Duchy. She carried out building works on her properties, gave to charity and collected more printed and illuminated books. She contributed her full support and advice to the rulers of Burgundy and Archduke Philip supported her in return. Her health began to slowly decline. She maintained her duties until she died suddenly on November 23, 1503. She was buried at the monastery of the Recollects at Malines. Her tomb and memorial were destroyed sometime during 16th C.
Wir sind sehr froh, dass wir Susan Abernethy für diesen Beitrag gewinnen konnten. Sie ist eine feste Größe im Bereich ‘History Blogs’ und trägt damit aktiv zur Vermittlung von Geschichte bei. Sie betreibt ein eigenes Blog und schreibt u. a. auch für medievalists.net. Anlass für die heutige Publikation ist der 567. Geburtstag der von Susan porträtierten Schwester des letzten englischen Königs aus dem Haus Plantagenêt, Richards III., dessen Skelett im Februar 2013 eindeutig identifiziert wurde, nachdem die Knochen bereits im letzten Jahr bei einer gezielten Grabung in Leicester gefunden worden waren. It seems I can’t remember a time when I didn't love history. At the age of fourteen, I watched “The Six Wives of Henry VIII” on TV and was enthralled. Truth seemed much more strange than fiction. I started reading about Henry VIII and then branched out into many types of history. This even led me to study history in college. Even though I never did anything with the history degree, it’s always been a hobby of mine. Recently a friend graciously allowed me to write for her women’s history blog, Saints Sisters and Sluts. I've decided to diversify and write my thoughts on all kinds of history from Ancient to mid-20th Century. Susan, we share the same passion for history. I, too, do not have a degree in it. I read your posts and thought, these could be the start of books for you. I am currently writing a historical novel set in the second half of the 12th century. My character is a Scottish girl (fictional) but she has ties to the Plantagenets, so I weave that history into her story. Looking forward to reading more from you! Thank you for your kind words. I may write a book some day. Your book sounds interesting. I love Scottish history too! Best of luck with the book.